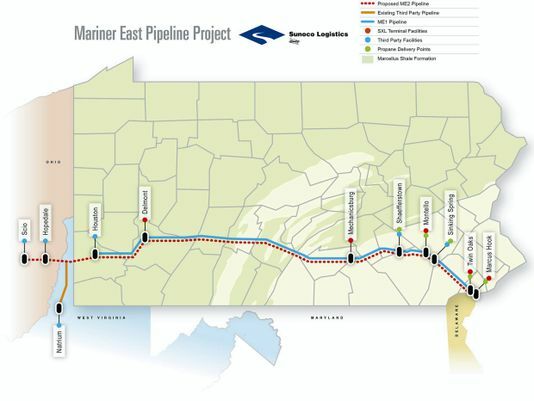 Evidence is now concluded in two Huntingdon County cases in which Sunoco Pipeline seeks eminent domain power for the Mariner East 2 pipeline. On December 14, 2015 Mike Faherty presented oral argument. Mike explained the historical background which led to the Property Rights Protection Act which prohibits eminent domain for private enterprise. He reviewed caselaw which prohibits eminent domian for a project with a public use and a private enterprise use. Sunoco argued it was a public utility corporation for purposes of Mariner East 2, and thus has the power of eminent domain. An Order is expected within weeks. The Sunoco Pipeline efforts to obtain eminent domain power moved to Lebanon County as described in the following news story. Landowners testified to property harms and significant loss of property value, if the condemnations are approved. Sunoco chose not to present real estate appraisal testimony. Instead, Sunoco agreed to bond amounts of value figures stated by the owners. Sunoco asserted it should be allowed to use eminent domain, because of status as a public utility corporation. Mike Faherty presented evidence which could be found to defeat the Sunoco effort based on multiple preliminary objections. A decision could be issued in January or February of 2016. The statewide legal battle between Sunoco Logistics and resistant property owners moved to Lebanon County Monday, with Senior Court of Common Pleas Judge Robert Eby promising a speedy decision on the company’s right to take property easements to build a pipeline.